I've been asked to produce a report on the effect of vendor delays on my timeline. I have a team of 6 engineers who are supposed to be a PC roll out team. The Vendor is delayed because of various applications other parts haven't been tested in the new environment. Which is leaving the rollout team idle for x amount of days. This is a given but how do I record this time and the knock on effect on the timeline. On paper the engineers should be knocking out 150 to 160 laptops per week. They work 8 hour days, so one per hour. We are rolling out 1700 pieces. How can I report this in excel, with the time constantly being impacted because of various applications and or infrastructure sometimes not being in place? 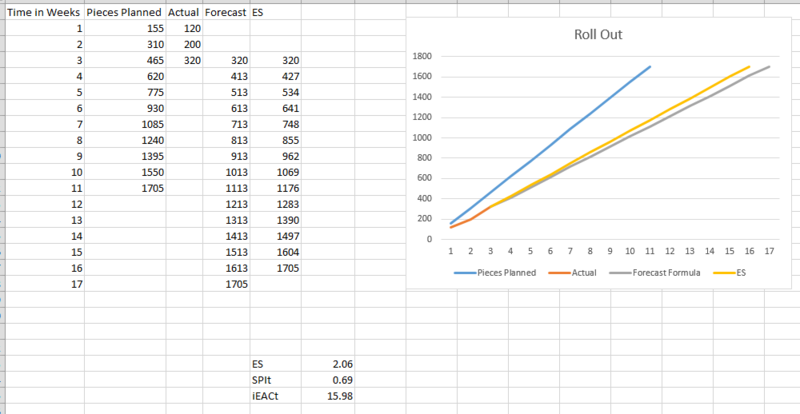 I used 155 as your planning value and loaded it assuming equal numbers each week, which produced a flat loaded schedule. Then I made up actual values but showed it to be behind the plan. From here, you can forecast where you are headed based on actual performance using a simple forecast formula in excel, or you could bring a bit more sophistication by using Earned Schedule analytics and it will predict when you will finish based on your schedule performance to date. The graphic is a nice way to show to stakeholders--easy to read and digest and hard to dispute in terms of your forecast from it. Not the answer you're looking for? Browse other questions tagged scope-management timeline or ask your own question.